His Highness Sheikh Mohammad Bin Rashid Al Maktoum, Vice President and Prime Minister of the UAE and Ruler of Dubai, today launched an ambitious strategy for smart self-driving transport as part of Dubai’s strategy to become the smartest city in the world. ”By 2030, 25 per cent of all transportation trips in Dubai will be smart and driverless. 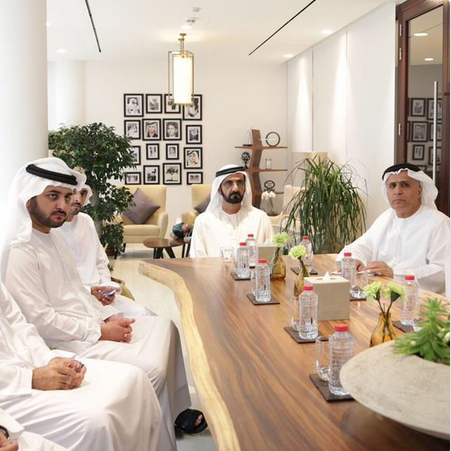 The strategy is projected to generate economic revenues and savings of up to Dh22 billion a year,” Sheikh Mohammad said. ”Dubai is leading cities of the world and making a qualitative paradigm shift to harness artificial intelligence in the service of the humanity and set a world unparalleled model for future cities, and is evolving into a global laboratory for technology and R&D. “Today, we lay down a clear strategy with specific goals for smart transportation to form one of the key drivers for achieving sustainable economy in the UAE,” Sheikh Mohammed said. When implemented, His Highness added, the strategy will reduce transportation costs by 44 per cent or Dh900 million, saving Dh1.5 billion through reduction of environmental pollution, and Dh18 billion through raising efficiency of the transport sector by 20 per cent. His Highness Sheikh Mohammad Bin Rashid Al Maktoum attends launch of a strategy for smart self-driving transport in Dubai. It will increase productivity of individuals by 13 per cent and save people up to 396 millions of hours wasted during travel on roads yearly. He indicated that the strategy will also contribute to reducing road accidents, and their associated economic losses, by 12 per cent, saving Dh2 billion a year. A joint venture between the Roads and Transport Authority and Dubai Future Foundation, the strategy focuses on four pillars: individuals, technology, policies and legislations and infrastructure. He said that the strategy will be the first project of the foundation to build a model of a futuristic city. Sheikh Mohammad also launched the Dubai World Challenge for self-driving transport, which he said would be the largest international tender for companies and research and development centres to implement scenarios and applications of this technology on Dubai roads. Sheikh Hamdan bin Mohammed bin Rashid Al Maktoum, Crown Prince of Dubai, Sheikh Maktoum bin Mohammed bin Rashid Al Maktoum, Deputy Ruler of Dubai, Mohammad bin Abdullah Al Gergawi, Minister of Cabinet Affairs, and Vice Chairman and Managing Director of Dubai Future Foundation, Mattar Al Tayer, Chairman of the Board and Executive Director of the Roads and Transport Authority (RTA), and a number of senior officials, attended the launch ceremony. His Highness Sheikh Mohammed bin Rashid Al Maktoum, Vice-President and Prime Minister of the UAE and Ruler of Dubai, on Monday honoured outstanding graduates of 24th and 25th batches of Higher Colleges of Technology (HCT) Dubai Men’s College, in the graduation ceremony. Among others present were Sheikh Hamdan bin Mohammed bin Rashid Al Maktoum, Dubai Crown Prince; Sheikh Maktoum bin Mohammed bin Rashid Al Maktoum, Deputy Ruler of Dubai; Sheikh Mansour bin Mohammed bin Rashid Al Maktoum; Dr. Ahmed Humaid Belhoul Al Falasi, Minister of State for Higher Education Affairs; and Mohammed Omran Al Shamsi, Chairman of the Board of Trustees of the Higher Colleges of Technology; Khalifa Saeed Suleiman, Director-General of the Protocol and Hospitality Department in Dubai, and a number of leading educational officials and guardians of the graduates were present. At the Men’s College, Sheikh Mohammed inaugurated the Martyrs Hall to the UAE’s fallen heroes. Al Shamsi said the number of honoured outstanding graduates was 228, who obtained distinction in Bachelors and Master Degrees, out of the total 7,300, comprising both males and females, from different HCT colleges.